DLA Piper was crowned International Law Firm of the Year for the second year running at the Middle East Legal Awards, underscoring the firm’s continued strong performance in the region. As the only international firm with offices in all six Gulf Cooperation Council countries, judges praised its regional ambitions and its ongoing efforts to put innovation at the forefront of client care and service in the Middle East. Clyde & Co, which narrowly missed out on the flagship prize, emerged as the biggest winner on the night, picking up three awards for CSR Initiative of the Year, Litigation Team of the Year and Arbitration Team of the Year. The awards – which were jointly hosted by Legal Week and the Association of Corporate Counsel (ACC) Middle East Chapter – took place at the Ritz-Carlton in Dubai yesterday (19 April) and were attended by nearly 400 lawyers from across the region and beyond. Some 24 prizes were up for grabs amid a record year of submissions from leading global and local firms and in-house legal departments. The awards highlighted the international legal industry’s commitment to the Middle East, with a number of large firms recognised for their work in the region. Pinsent Masons was named Real Estate Team of the Year for advising on a giant luxury shopping centre and hotel project in Dubai, while Baker McKenzie took home the Regulatory and Investigations Team of the Year award for guiding a client through a complex international regulatory probe. A number of winners joined DLA in retaining their titles for a second year running. Simmons & Simmons collected the TMT Team of the Year prize again, while Dentons held onto the Construction Team of the Year title for advising on a shopping mall and entertainment development in Abu Dhabi. Bracewell, meanwhile, took home Infrastructure and Energy Projects Team of the Year for a second consecutive year. The big regional winner was Al Tamimi & Company, which was named Regional Law Firm of the Year (large practice), also for a second year running. The Dubai firm also scooped the Corporate Team of the Year prize to ensure it was the most successful regional player at this year’s awards. 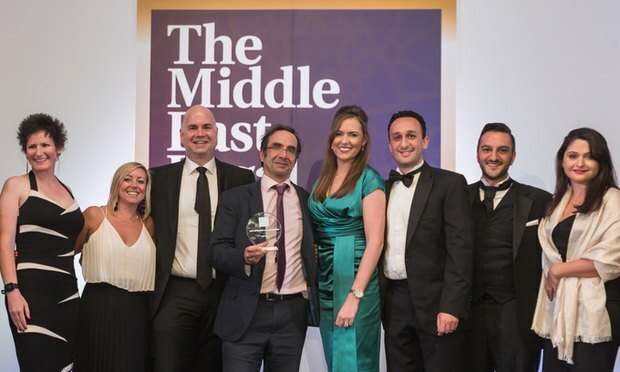 Tribonian Law Advisors (in association with Rindala Beydoun Legal Consultancy) collected the Regional Law Firm of the Year (small practice) award, praised by judges for landing a number of high-profile M&A deals ahead of much bigger competitors. Satellite TV broadcaster OSN’s in-house team was named Legal Department of the Year (large team) in recognition of its efforts to continuously go above and beyond its remit, while building technology services provider Johnson Controls Middle East & Africa picked up the Legal Department of the Year (small team) award for supporting business development and driving growth across the company. Dr Zaid Mahayni, group chief legal officer at SEDCO Holding, was crowned General Counsel of the Year (large team) for his strong leadership skills, while Microsoft Gulf’s Joanne Fischlin was named General Counsel of the Year (small team) for transforming how the wider business views and interacts with her department. The final prize of the night – the ACC Middle East Achievement Award, presented by ACC Middle East president Sahia Ahmed – went to Mark Beer OBE, chief executive of the Dubai International Financial Centre’s Dispute Resolution Authority, who has been instrumental in developing the commercial court system in Dubai, which is part of the reason why many companies have been eager to run their regional business from the DIFC.